The mosquito, sworn enemy of exposed ankles and elbows, locates each bloody meal using a finely tuned sense of smell. Yet, not all insects can sniff out vulnerable flesh. Butterflies, for example, feed not on necks but on nectar, and accordingly excel at smelling flowers. Each insect olfactory system is, in fact, tailored to a species' particular habitat and needs. And a new study from a group of Rockefeller scientists suggests that this versatility is facilitated by the unique structure of odorant-gated ion channels. In a recent paper, published in Nature, Vanessa Ruta and colleagues describe the structure of one such ion channel and propose an explanation for how diverse channels evolved to accommodate insect life in a large variety of ecological niches. Insect odorant receptors were first identified nearly two decades ago by Leslie Vosshall, now the Robin Chemers Neustein Professor at Rockefeller. Specific to insects, these structures are completely different from odorant receptors in humans and other animals; and for many years, researchers could not determine what they looked like or how they worked. Taking advantage of recent advances in electron microscopy, Ruta's research thus answers long-held questions about insect olfaction and evolution. Different insect species have different numbers and types of odorant receptors, reflecting the range of smells that matter to bees, termites, cockroaches and their myriad insect brethren. Researchers estimate that tens of millions of receptor varieties have evolved, each tuned to detect a specific chemical, or odorant. Despite this diversity, all receptors function the same way: they form an ion channel—a passageway for charged particles—that opens only when the receptor encounters its target odorant. "Insect odorant receptors are very likely the largest family of ion channels in nature, and they're incredibly diverse," says Ruta, the Gabrielle H. Reem and Herbert J. Kayden associate professor. "So we were faced with a fundamental mystery: how do you get millions of variants of a channel that are so different but that all do the same thing?" To understand how insects achieve this delicate balance of diversity and consistency, Ruta's team set their sights on a channel subunit known as Orco. Olfactory ion channels are made of one Orco protein and a combination of odorant receptor proteins, which vary from species to species. Because Orco appears so consistently in the insect world, Ruta's team suspected that, by studying this subunit, they could develop a better understanding of how these channels work. 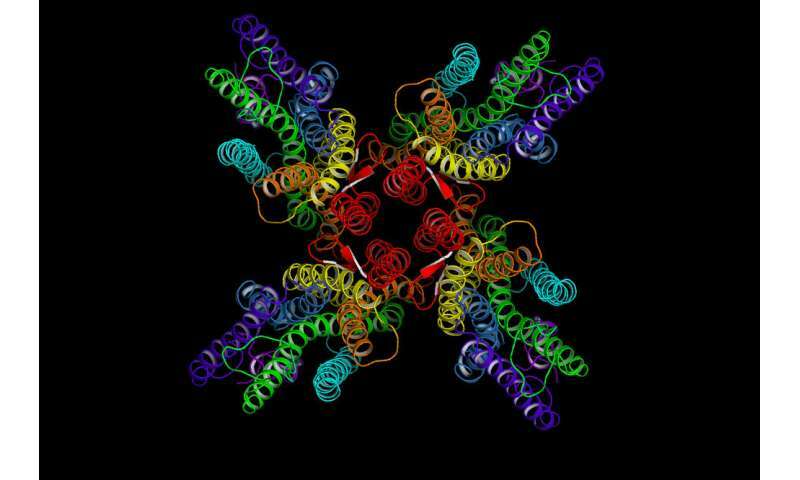 Using cryoelectron microscopy—a method of analyzing protein features by beaming electrons at a frozen specimen—the researchers defined the structure of a channel made entirely of Orco proteins (called an Orco homomer). They found that this channel consists of a central pore, the region through which ions flow, surrounded by four subunits. They also observed that the subunits are bound together at a single point, which Ruta termed the anchor domain. "It's almost like a bouquet with each flower held together at the center and the stalks splaying apart in different directions," she says. More than just pretty, this microscopic bouquet offers clues about how receptor diversity evolved. Previously, it was unclear how a single complex might physically accommodate the variety of odorant receptors found in nature—how protein "stalks" made of different amino acid sequences could both attach to Orco and interact harmoniously with one another. Yet, once Ruta observed the structure of the Orco homomer, she says, it all made sense. "If proteins are tightly packed together they have to chemically complement one another; but these subunits are packed together very loosely—they barely touch," she says. "By concentrating interactions in the anchor domain, the rest of the protein can diversify and evolve very rapidly." In another experiment, the researchers analyzed odorant receptors from four very different insect species. They found that, though these proteins vary greatly, they share common features in the pore and anchor domain, suggesting that these receptor components are conserved across species. Further, the researchers suspect that Orco functions as a failsafe, ensuring that if these regions mutate, the channel can still do its job. "Orco is performing two roles: it's keeping everything together; and it's also helping the channel function properly," says research associate Joel Butterwick, lead author on the study. "The regions involved in binding different odors are free to evolve because you have a stable component that holds everything together." Beyond providing insight into insects, this line of research may ultimately lead to innovations from which humans can directly benefit. At the very least, mosquitoes bites cause itchy, irritating bumps; but in many parts of the world they can also transmit serious illnesses, including malaria, the Zika virus, and dengue fever. And one way of preventing these diseases is to interfere with insects' ability to smell their human hosts. Says Ruta: "We hope to take advantage of our structural insights to eventually develop better repellants, and help relieve the human health burden associated with malaria and other mosquito-borne diseases."